(Nanowerk News) A brand-new competition, awarding finalists the opportunity to present their entries at the 2016 USA Science & Engineering Festival and compete for cash prizes, opens today for high school students interested in science, engineering and superpowers. 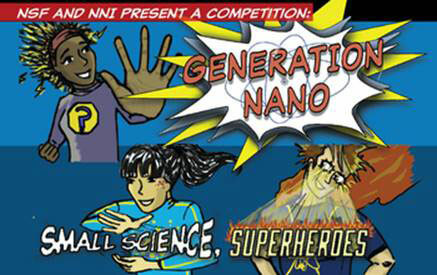 Generation Nano: Small Science, Superheroes is sponsored by the National Science Foundation (NSF) and the National Nanotechnology Initiative (NNI). The competition invites individual students enrolled in U.S. high schools, or who are home-schooled, to submit an original idea for a superhero who uses unique nanotechnology-inspired "gear," such as a vehicle, costume or weapon. Generation Nano encourages students to think big--which, in this case, means super small--when pondering their hero's gear: shoelaces that decode secret radio waves, nanotechnology-infused blood cells that supercharge adrenaline or clothing that can change color to camouflage its wearer. "The wonders of nanotechnology are inspiring an increasing number of young students to pursue science and engineering," said NSF Senior Advisor for Science and Engineering Mihail C. Roco. "The Generation Nano competition recognizes and channels that interest, while giving students the chance to showcase their creativity at a national level." "I'm just thrilled about Generation Nano," said Lisa Friedersdorf, deputy director of the National Nanotechnology Coordination Office. "This competition has the potential to excite students about science and introduce them to the novel world of nanotechnology. I can't wait to see the submissions." Students must submit a written entry explaining their superhero and nanotechnology-driven gear, along with a one-page comic or 90-second video. Cash prizes are $1,500 for first place, $1,000 for second place and $500 for third place. Finalists will showcase their comic or video at the 2016 USA Science and Engineering Festival in Washington, D.C. Final-round judging will take place at the festival. Submissions are due by midnight on Feb. 2, 2016. Through nanotechnology applications like targeted drugs, self-assembled nanodevices, molecular motors and other innovations, students never have endure a radioactive spider bite to realize their full potential.